We can't stop eating these cookies! They are super yummy! 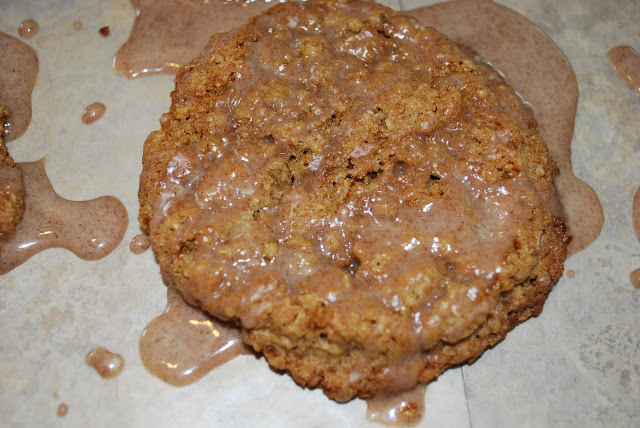 The cookbook we got the recipe from, Good to the Grain , described them as being a lot like Mother's (the brand name...not my mother's) oatmeal cookies that have the glazed icing. You know, the ones that come in the red and purple packages that you get at the grocery store. They really do taste a lot like them and you know that they are much healthier too. We are loving every bite! Directions: Place two racks in the upper and lower thirds of the oven and preheat to 350 degrees. Lightly grease two baking sheets. In a food processor, grind the oats to a coarse meal that still has a few large flakes, about 10 seconds. Sift the dry ingredients into a large bowl. In a small bowl whisk the butter and eggs until thoroughly combined. Using a spatula, add the wet ingredients to the dry ingredients and combine. Scoop balls of dough (the recipe in the book says 3 Tbsp size, but we found that made the cookies too big, we'd suggest smaller balls of dough) onto the cookie sheet, leaving 3 inches between them. The cookies will spread quite a bit. Bake for 16 minutes, rotating the sheets halfway through. Cool the cookies on a rack. For the frosting, whisk together the frosting ingredients until smooth and about the consistency of honey. Decorate the cooled cookies on a sheet of parchment . Drizzle frosting over the cookies and let the frosting set for 30 minutes before eating.